This historic property is surrounded by old buildings and villas and radiates by its numerous style elements extremely much charm!This villa was built around 1911 on a plot of approximately 549 square meters and is divided into seven rooms with approximately 197 square meters of living space. A windscreen takes you through an original wooden door into the hallway.From there you enter the living and dining area and are also surprised by very well-kept and classic style elements such as lattice windows, sliding doors, oak herringbone parquet, high Hamburg baseboards and an open fireplace. Another sliding door with glass elements makes the kitchen in an open living or in a closed atmosphere.The Bulthaup kitchen dates back to the 1980s and was fitted with a new worktop and revised fronts last year. The adjoining the kitchen conservatory was also built in the 80s and offers with the large windows the perfect flair to this villa. From here, two doors take you directly to the garden, as well as to the terrace, which can be used for example. for cozy summer evenings with family and Invite friends. From the living and dining room you also get to another small terrace, which has balcony character due to the design. This is on the south side of the property. Also located on this level is a study and a bathroom with tub.A white lacquered curved wooden staircase leads you to the upper floor and further into the attic. A very special detail - the stained-glass stained-glass window - lets the entire stairwell shine in the daylight. Upstairs you will find a spacious bathroom with bathtub, which offers access to the balcony through a large patio door. From the adjacent bedroom and dressing room access to the balcony is also possible. 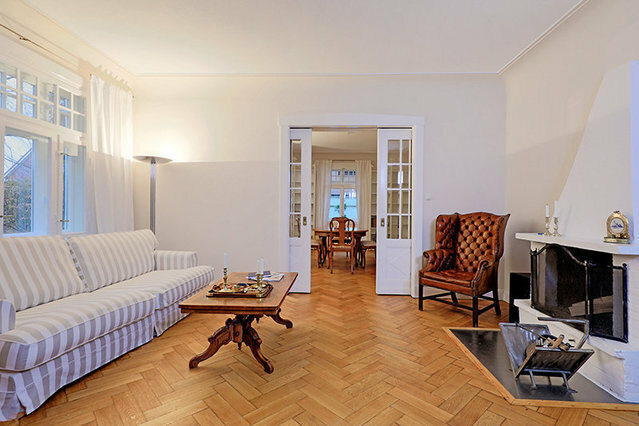 The light-flooded rooms impress with their great floorboards and spacious built-in wardrobes. In the attic you will find a third bathroom with shower and two other comfortably furnished rooms that can serve as a nursery or bedroom.You have plenty of space for accommodation in the basement, in which also ideally a hobby room could be set up. One of the storage rooms leads to the southern terrace and garden area as well as to the sauna. Many windows were replaced in about 2012/2013 and the gas central heating was renewed about 2006/2007. To show you what this charming villa has to offer, we look forward to seeing you soon!